What if you can’t do one pull-up? A big downside to pull-ups when it comes to the general population is that they are not easy to do if you aren’t already athletic and strong. Luckily there are ways to work up to being able to do full pull-ups. Assisted pull-ups are often not the easiest to perform logistically but they are the most effective in working up to full bodyweight pull-ups in my opinion. Assisted pull-ups are performed as standard pull-ups are except your feet/legs or torso are somewhat supported by either a tall stool or a workout partner. This takes a percentage of your bodyweight out of the exercise, thus making it easier. Another way, which is relatively nice and easy but the least effective in my opinion is using the Lat Pulldown cable machine (found in virtually every commercial gym). I recommend this one the least only because, as with many machines, the movement is more restricted. That being said, it is a similar movement and works essentially the same muscle groups so it can be a useful substitute or progression to the pull-up. Finally, a very effective alternative exercise is the inverted row also known as the supine or bodyweight row. This requires equipment such as gymnastics rings or a TRX apparatus (Essentially handles hanging from a high bar or ceiling). 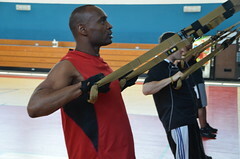 In the inverted row the plane of motion is different than the pull-up but the muscle groups activated are very similar. The great thing about this exercise is that it can accommodate just about any ability level. The difficulty can be easily adjusted by where you are standing in relation to the apparatus. Progressions in this exercise to increase difficulty can be used as well. Now for the fun part. For those of us who can bust out 10 or more pull-ups without a problem, here are several ways to make this exercise more exciting and to keep improving. Narrow/wide/parallel grips: Switch up the grip to give the exercise a slightly different feel. Thick bar: Using a thicker bar to grip will tax your forearms even faster. Weighted pull-ups: Use a weight vest/belt, a dumbbell between your legs, or, if you’re a beast, a partner holding on to you to increase your weight. L-sit pull-ups: For added difficulty and core work, do each set of pull-ups with your legs straight out ahead of you making a 90 degree angle at your hips. Towel grip pull-ups: Drape a towel or two over the bar and perform your sets gripping the towel for an added challenge to your grip strength. Clapping pull-ups: Most people have heard of clapping push-ups but using the same idea with pull-ups will build tremendous power in your upper body. One handed pull-up: I’m not talking about the faux “one handed pull-up” where the other hand is gripping your wrist. I mean a legit pull-up using only one arm. Very few can perform these. Weighted, one handed, towel grip, L-sit clapping pull-ups: I don’t think anyone has ever done these but hey, get to work on them now and maybe you’ll be the first! Now that I’ve gone into all this detail about how awesome pull-ups are I will say that they, unfortunately, are not safe for everyone. Anyone with serious shoulder problems should be careful with them and if you notice any significant joint pain beyond muscle fatigue/soreness while doing pull-ups you should stop immediately. Now go out and get pulling! Next time you find yourself hanging off the edge of a steep cliff you’ll be glad you did!